In my house we love burgers, normally I make it with beef and we love them. But one day whilst cleaning out the fridge, I had a little bit of mince and a few chicken thighs I needed to use up. So I decided on burgers that night. I made a few beef patties and I decided to crumb the chicken thighs. I had seen this recipe before, so I thought I'd try it. The beef patties I used to make my Burger Night at Our House burgers, we love these burgers, and with the chicken I decided on this recipe. Here the mayonnaise gets a bit of heat from the hot sauce, add some bacon and you get a great baconnaise. 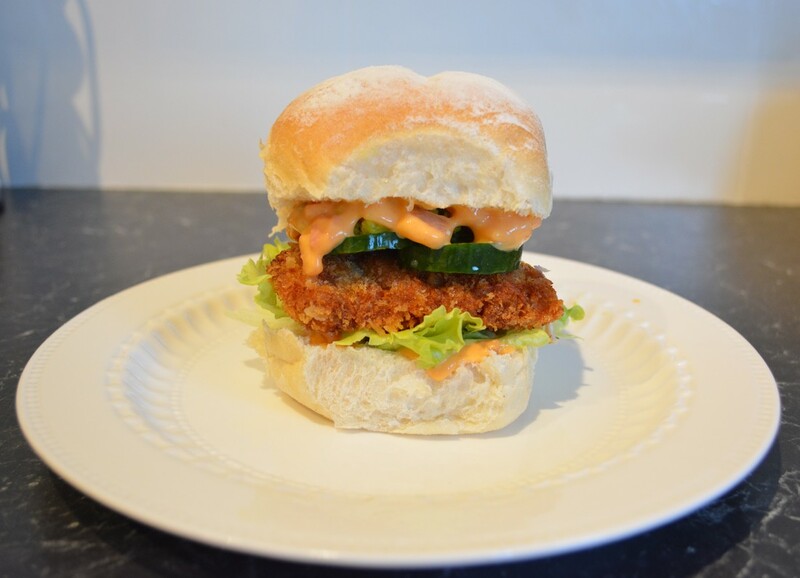 Add in a crispy schnitzel and some cucumber and lettuce and you have an absolutely delicious burger. The great thing about this recipe is you can make this for one person or you can make it for as many as you like. 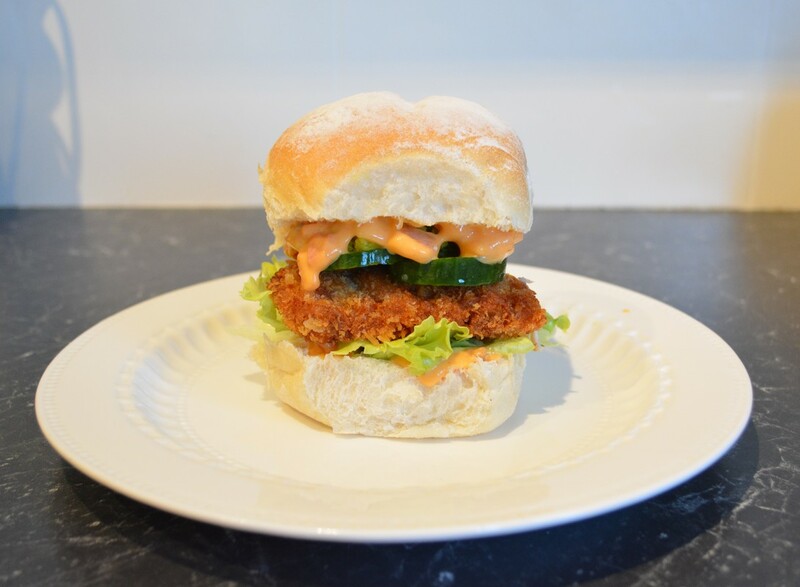 You can purchase pre made chicken schnitzels, but I much prefer homemade ones and I love panko crumbs for this,for the added crunch it gives. You can substitute hot chilli sauce for sweet chilli sauce. You can also use uncrumbed chicken, instead of crumbed ones. I love Thomy mayonnaise, but you can use any whole egg mayonnaise that you love. This for me is a great burger, it tastes so good, every single bite is delicious. Prepare your chicken thighs: Your chicken thigh has a thick side. This needs to be butterflied so that the piece is uniform in thickness and each piece looks like the one pictured below. To butterfly you just slice the thick bit from the centre out horizontally, but you don't slice the whole bit off, leave it attached the the rest of the thigh, then you just flap it open to form a longer evenly thick piece of chicken thigh. Season with salt and pepper. Prepare to crumb the chicken: Place flour in a bowl. Place the egg and milk in another bowl and whisk until combined. Place the panko crumbs on a long plate that will fit the chicken thighs, for easy crumbing. Dust the chicken thighs in the flour, shake off excess flour. Dip into the egg wash, then place on the crumbs. Gently press the crumb mixture all over the chicken thighs. Repeat until all the chicken is done. To make the baconnaise: Heat a tablespoon of oil in a large, deep non stick frying pan over a medium to high heat. Add the bacon, cook, stirring, for about 3 minutes, or until crisp. remove from pan. Transfer to a small bowl. 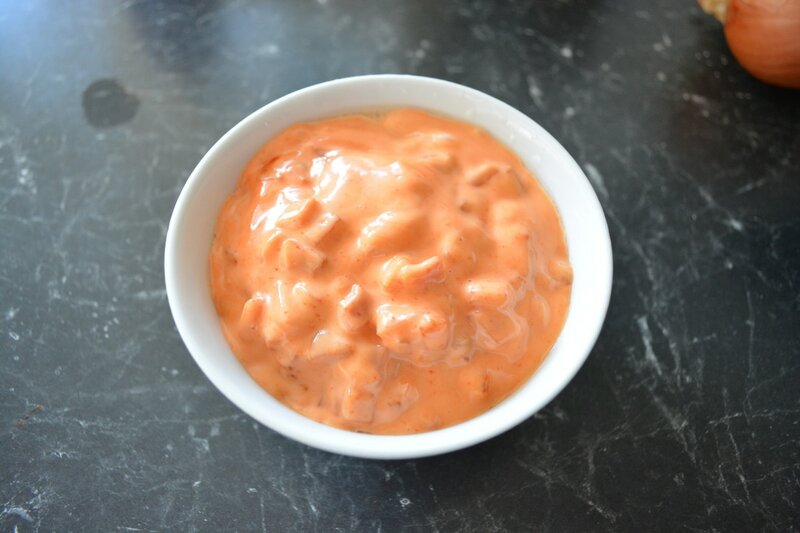 Stir in mayonnaise and hot sauce. Set aside. Using a vegetable peeler, peel the cucumber lengthways into long, thin ribbons. Alternatively, you can just slice it up into thin slices. Heat the oil in the same pan you cooked the bacon in over a medium heat. Add chicken. Cook for about 4 minutes on each side, or until golden brown and cooked through. Drain on absorbent kitchen paper. Divide lettuce, chicken and avocado among rolls. Spread with baconnaise. Top with cucumber. Replace lids. Serve immediately.